How to Start Shopping Local TODAY! Grocery shop the local way, online. It’s like going to the farmers’ market, but from home. The Iowa Food Cooperative makes it easy to shop for your locally-grown groceries online. Shop by department: Fill your cart with over 1,500 items that are all made, grown, or raised in Iowa. Start with the basics–eggs, milk, cheese, and locally-milled flour. Grab some coffee or tea, along with freshly-baked bread. Add seasonal, fresh-picked produce, and our year round availability of greens. Try a prepared soup or entree for a quick meal, and get a chicken and some hamburger for the freezer. Don’t forget locally-made ‘health and beauty’ items, like soaps and lotions. Our categories + subcategories allow you to find what you need and discover new items. In addition, you can search for specific items to add to your cart and even search by farmer/producer. Add to your cart then pick-up: When the cart is open, you’ll receive an email. It stays open for just under a week. Shop often and add items as you think of them. You will receive an email the day before the cart closes. Once it’s closed, your order is placed. Pick up your order on the Thursday or Saturday of that week, at one of our convenient locations. Or, choose home delivery and have your order brought to your door! To get started, simply complete a membership form–no credit card required. Choose ‘Trial Membership’ under ‘Membership Type’ and enjoy a six month membership, free, on us! If the IFC doesn’t work for you, your membership will simply expire. Still have questions? Check out this post on how exactly the food cooperative works. IFC Annual Potluck and Meeting Is Set For November 3rd! IFC members and producers, MARK YOUR CALENDARS! We will be conducting our annual meeting on the 3rd of November, a Saturday, at the Mickle Neighborhood Resource Center in Sherman Hill from 5-7. All members and producers are encouraged to attend! There will also be a tour of the Mickle Center’s kitchen facilities beginning at 4, highlighting the kitchen’s progress to become a licensed facility. At the meeting we will discuss our struggles and successes over the past year, and where we will go in the coming year. We will also elect new board members. This meeting will be fun and informal, and children are welcome to attend. Please bring along a main or side dish for the potluck if you can. IFC will provide drinks. Table service is requested as well, we will need some people to bring silverware and plates. Please contact us at info@iowafood.coop if you have any questions regarding the meeting. We look forward to seeing you there! Price. A check on 28 comparable products at Whole Food found that their prices were on average 22% higher than the Iowa Food Cooperative. 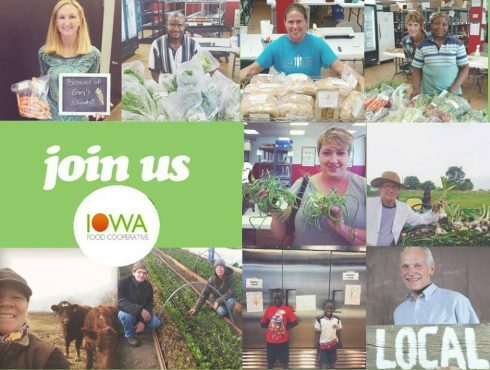 90% of what you pay for food bought through the Iowa Food Cooperative goes straight to its farmer-owners (the other 10% helps run the business). Whole Foods can’t do the same. 100% of our products are locally-grown or produced. Their goal is 20% (yes, only 20%). 100% of your money stays local (as opposed to being shipped off to Texas). Every dollar you spend helps build our local economy (one of the most direct things you can do to make our communities better). Finally, our producer and consumer members own the Iowa Food Cooperative. Ownership is ours. It’s our business to hold, cherish, patronize, and promote. If you haven’t already joined, please become a member and help us build our commuities from the inside out. We’ve got incredible products (nearly 9oo different items are available at the moment from our on-line store) from truly amazing local farmers. The 2011 Annual Meeting of the Iowa Food Cooperative was a success! Thanks to all who took part in making it happen, and to producer member Lavon Griffieon of Griffieon Family Farms for hosting the event. Thank you also those who attended, for the wonderful food and for taking part in the panel discussion. Per request here are the slide show and the audit presented at the meeting. I noticed last cycle, a few of you purchased garlic-scapes, but what do you DO with them? Diane Starkey, has a delicious way to experience their garlicky goodness posted on her blog, in fact, check out her whole blog, she also has plot at Franklin community garden, she might be your neighbor! We are so lucky to have access to some of the best that Iowa as to offer. Don’t you want to share that with the ones you love? Why don’t you give your family and friends an IFC Christmas this year. You would be supporting local businesses and proudly giving them the best! Since everybody is growing beards and hunting, how about a Hunter’s Delight Basket? Fill it with Ebersole jerky, TimberRidge beef sticks, Griffieon Farms summer sausage and a Heart of Iowa Bay Rum shaving bar for when hunting season is over. What about a Party Hostess basket filled with yummy Gouda cheese from Frisian Farms, Cheddar cheese bread from Threshing Floor, a ring bologna from Griffieon Farms, Summer Sausage from TimberRidge, and for something different, Goat and Pepper Cheese Sticks from LaVentosa. Dont forget to take your hostess a lovely poinsettia from Homestead! Or maybe its just All About Me. This basket could include a delicious wine from Jasper Winery or Rosey Acres Winery, Organic Herbal Baths from Rosebud Botanicals, lotion from Griffieon’s Farmhouse Suds, a soft washcloth from Heart of Iowa and of course, fudge from Wagner Enterprises. Perhaps you would like to help someone live a greener life and help protect our enviroment and body from chemicals by putting together a Green Clean basket. You could give Grandma’s Soap Multipurpose Cleaner and also their Wood Cleaner, Laundry Soap from Heart of Iowa, hand soap from Rosebud Botanicals, a Griffieon Family Farms crocheted dishcloth, and maybe a set of hand-embroidered tea towels too. If you really want to up the green clean value, add a flat of wheatgrass from Wheatgrass to Go! Then they will be clean inside AND out! If you know someone who is a DIYer, give them a Pork Belly from Iowa Farm Families and a bundle or two of Apple Wood from Berry Patch Farm so they can cure and smoke their own bacon. Not into the curing part? Give them a pork roast and some apple wood to smoke their own Canadian bacon. Maybe they would rather make their own laundry soap? Grandmas Soaps offers a make your own Laundry Soap kit. If they love to can give them a bushel of apples from Berry Patch to make their own apple butter or can their own pie filling. Now this would be a basket I would love to receive. A Good Morning World Breakfast Basket! It could have Greene Bean Coffee, eggs from Raccoon Forks, Wild Rose or Annas place, Crooked Gap bacon from their heritage hogs, Caramel Pecan Cinnamon Rolls from Daily Bread or English Muffin Bread from Country Lane Bakery, maybe even the Buckwheat Pancake mix from Country Lane too and honey from Novae Vitae as a sweet treat to top it all off. Of course a jar of jam from Twin Girls Garden is always a welcome gift! Grandma’s Soap is offering gift baskets already put together for you, Live Now Rest Later offers personalized silver jewelry for that hard to buy for person. For something different, what about a gift ham? Iowa Farm Families offers quarter, half and whole pit hams. Or a pie? How about a delicious pie from Wagner Enterprises? Woven rugs, caps and berets from Two Cedars Weaving to keep them warm, a beautiful shawl from Hibbs Farm plus Rosebud Botanicals Lip Balms make great stocking stuffers. Or, just give them a gift membership to the Iowa Food Coop, to quote National Lampoon’s Christmas Vacation “Its the gift that keeps on giving”. I had heard someone mention that she renders her own lard, it was Diane Starkey to be exact, I then read a little about it on Mary janes Farm forum. I then realized that Crooked Gap Farm was having a pie bakers special on lard, so jumped at this opportunity to make my render own. I use lard in my pie crust, ask my family, it makes the best pie crust, but I didn’t realize that the store brand that I buy is partially hydrogenated which equals bad and unhealthy. Well I’m not gonna eat that much less serve it to my family, so rendering my own lard is the only logical step, right? I’m not changing my crust, I’m certainly not gonna stop making pies! I did as much research as I could find, and of course there is tons of info out there. But knowing myself, I needed an idiot proof way to do this the first time out, so crockpot lard it is. Use clean largemouth jars and clean lids and rings. (1) My lard arrived in 4 – 5 pound chunks, and was already ground up. If yours is not, cut into very small chunks or grind, it makes the whole process much nicer. You can use frozen, or thawed, it didn’t matter much in my case. (2) Put the lard in your crockpot, add a 1/2 cup of water, cover, turn on low and let cook for about 3 hours. Check it, stir it so nothing browns or burns. I checked and stirred every hour or two. (3) when most of the fat is melted down, (12 hours for me), start filtering and putting into wide mouth jars or containers. I put a funnel in my jar, then a strainer, then a coffee filter. Filter while you jar as once it starts cooling it doesn’t filter very well. You do want to filter and not just strain, especially if you intend to use for pastries, it makes a nicer end product and no pork odor. Start filtering and jarring before the lard starts browning. When jar is full, lid it and put in the fridge. You can keep it in the fridge or freezer. Opinions vary! I am keeping the jar I have opened in the fridge, and freezing the rest. Im told it keeps a long long time in the freezer. Resist the urge to store it outside the fridge or freezer, I have heard too many sad stories of rancid lard for me to think that is a good idea. (4) what is left in the crockpot will need to keep cooking, but keep checking and stirring and pouring off, filtering and jarring until its just solid stuff and its difficult to get any more liquid out. This lard will be light but will turn white when it cools. (5) transfer out these semi solids to a tall pot and keep cooking on medium low watching carefully and stirring so it doesn’t burn. As the liquid rises to the top, scoop out solids and oils and filter and jar as before, just stir the solids around so the liquid filters into the jar. Keep doing this until the solids are nearly dry. Keep watching and stirring so it doesn’t burn. This lard is amber, but will turn creamy white as it cools. This will be good for savory dishes and frying. I am baking pies tomorrow, so I will see how my lard stands up, I have a feeling it will be pretty awesome, I will keep you posted! While I realize this may not be the most timely of posts, it is an important one. I was drafting the latest announcement to our members, you the owners of this Iowa Food Cooperative, and I came across a message I had sent early in the year. It was intended to address the concerns around sparse picking in the way of vegetables, and greens. I recall I checked ‘the Google’ and quickly found a great resource: The National Resources Defense Council (NDRC) has created a great listing by state. In that long-ago email, I posted this same link to Iowa’s in season produce. As my wife & I have become increasingly dependent upon seasonal food and days get colder, I begin to think about pumpkin-pie and apple cider, and Turkey. Oh yes! Thanksgiving is just around the corner! Our stairs have become an impromptu root-cellar. I have big feet, and I’m always afraid I’m going to make some accidental mashed potatoes as I head downstairs. Apples, Broccoli, Brussels Sprouts, Bunching Greens, Cabbage, Carrots , Celery, Collards, Garlic, Head Lettuce, Kale , Kohlrabi , Leeks, Lettuce Mix, Onions , Oriental Greens, Ornamental Corn, Parsnips, Potatoes, Pumpkins, Raspberries, Snap Peas, Snow Peas , Spinach, Turnips, and Winter Squash. Lots of good stuff in there. I look forward to this fall season as a close to my first year as board-member and I believe 4th year as conscientious consumer of local foods. What I mean by that is that I have been a fan of the idea for some time, it was about 4 years ago now that Lori introduced me to the bounties of Turtle Farm CSA, an IFC Member by the way, and her passion for ‘Good Eats’ (a nod to Alton Brown there). Well I’ve rambled enough. Here’s to a wonderful upcoming season of thanksgiving. Support your local farmers, and lets not forget those artisans, makers of things too. This isn’t your typical egg farm. In Elkhart, Iowa, about 70 miles south of Wright County Egg–the mega-farm at the center of a 550 million egg recall tied to almost 1,500 Salmonella illnesses–colorful hens are milling around Foxhollow Farm. Lyric-less rock music is playing in the hen house, and it’s for the hens. The head rooster, a five-year-old Black Cochin Bantam named Shadow who appears to run the place, is friendly and strutting for the camera. In many ways, Foxhollow Farm represents the antithesis of large-scale egg production in Iowa, which produces more than twice as many eggs as any other state. Foxhollow has about 200 laying hens. Wright County Egg, one of the top 10 egg producers in the country, has millions. Foxhollow allows its chickens to roam, following Animal Welfare Approved guidelines. Wright County Egg uses battery cages, a practice animal welfare activists are trying to ban. A dozen Foxhollow eggs will run you about $4.50. Wright County Eggs, sold under more than a dozen labels in more than 20 states, are closer to $1. And then there is the issue of transparency. Despite numerous attempts, Food Safety News and the Iowa Egg Council, were unsuccessful in finding a single large-scale producer willing to give a tour or in-depth interview on egg production and the new Food and Drug Administration egg safety rules. Tai Johnson-Spratt, who runs Foxhollow Farms with her husband Thomas Spratt, offered a tour with less than a day’s notice. Well under the 50,000 bird cut off, Tai’s farm doesn’t have to follow the new FDA egg regulations, but she’s actively managing chicken health and food safety. If a chicken shows signs of illness, it is taken to the Iowa State poultry extension for a diagnosis. Drugs are administered only at the advice of Foxhollow’s poultry veterinarian. Salmonella is much trickier to control, because birds do not show symptoms. The hatcheries are monitored for Salmonella, explains Tai. “All the hatcheries are supposed to be 100 percent pullorum-free, which should prevent Salmonella from reaching anybody’s plates, but that’s not always the case,” she says, because the bacteria can creep into a poultry house on the farm. Foxhollow collects eggs three times a day and refrigerates them right away to stop any bacterial growth. The eggs are then sanitized and refrigerated until they reach the consumer. Tai has an Iowa egg handler’s license and she takes her keeping-the-eggs-below-40-degrees duty seriously. “We do things the way we’re supposed to,” she says. Though Foxhollow can hardly keep up with demand for its eggs–and its heritage chickens and turkeys–the farm represents only a tiny, though growing, fraction of Iowa’s poultry industry. Foxhollow sells somewhere in the neighborhood of 3,600 dozen, a little more than 43,000, eggs per year. Iowa produces 14.25 billion eggs per year, according to the Iowa Egg Council. Tai admits cost also has a lot to do with it.